The Indian aircraft carrier (IAC) INS Vikrant undocked on June 10, 2015 at a simple ceremony held at the Cochin Shipyard Limited (CSL). The two sides conclude their second round of talks on aircraft technology cooperation. Last week, the United States and India held a meeting in New Delhi to discuss their ongoing cooperation on aircraft carrier technology. The second meeting of the Joint Working Group on Aircraft Carrier Technology Cooperation (JWGACTC) took place from February 15 to February 18, with high-level delegations from the Indian and U.S. navies. JWGACTC was established as part of the bilateral Defense Trade and Technology Initiative (DTTI), a mechanism first mooted in Washington in 2012 to expand defense cooperation with New Delhi, including through the transfer of key technologies for co-development and co-production. 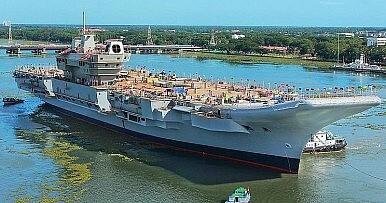 One of the highlights in the aircraft carrier domain has been the possibility of the United States equipping India’s planned Indigenous Aircraft Carrier-II (IAC-II), which will be called INS Vishal, with an Electromagnetic Aircraft Launch System (EMALS) (See: “India’s New Aircraft Carrier Plans May Get A Boost”). As I have noted previously, EMALS, which was developed by the U.S. firm General Atomics (GA) for the U.S. Navy’s Gerald R. Ford-class carriers, would enable aircraft to be launched more quickly and easily, thus allowing India to carry larger, bulkier, and more heavily armed aircraft relative to a ski-jump launch system. During the first JWGACTC in Washington last August, the Indian delegation had held talks with their U.S. counterparts and visited the USS Gerald R. Ford, which is fitted with EMALS. As with that first meeting, the second one last week was aimed largely at both discussing the specifics of potential cooperation – including technological issues and bureaucratic procedures – as well as gaining familiarity with each other’s defense equipment. The discussions were headed by Rear Admiral Thomas J Moore, a program executive officer on aircraft carriers with the U.S. navy, and Vice Admiral GS Pabby, controller of warship production and acquisition. Indian officials were silent about the exact outcome of the meeting, with a press release from the defense ministry merely noting that ongoing cooperation was discussed and a joint statement inked during the concluding session of the meeting. No further details were provided. “During this meeting, various aspects of cooperation in the field of aircraft carrier technology were discussed and a joint statement signed,” the statement said. Earlier, Indian media reports had cited sources within the defense ministry as suggesting that the talks had not included the possibility of the United States providing India with nuclear propulsion technology for its IAC-II carrier. Much like the Indian delegation did during their trip to the United States last August, the U.S. delegation also visited various defense industrial installations in India, including the Shore Based Test Facility at Goa, Bharat Electronics Limited (BEL), Bengaluru and Cochin Shipyard Limited (CSL), Kochi. The delegation also visited the first Indian indigenous aircraft carrier being constructed at CSL. The next round of JWGACTC talks is scheduled to take place in the United States in July. U.S. Defense Secretary Ashton Carter is also set to visit India in April, where he will seek progress on the so-called foundational agreements that Washington needs India to confirm in order for the United States to legally move forward on expanding bilateral defense cooperation. Would the Boeing F-18E or Dassault Rafale M be better suited to operating from India's new aircraft carrier?